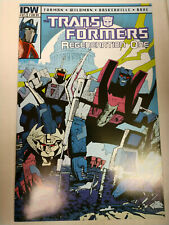 TRANSFORMERS : REGENERATION ONE # 80.5 FCBD UNMARKED IDW 2012 NICE!!! TRANSFORMERS : REGENERATION ONE 100-PAGE SPECTACULAR $7.99 IDW 2012 NICE!!! This page was last updated: 26-Apr 03:24. Number of bids and bid amounts may be slightly out of date. See each listing for international shipping options and costs.